Blue Latitude is a twelve‐piece band featuring female and male lead vocals, and a five‐piece horn line. Available for large events, parties, weddings or any special occasion where fun high‐energy music is needed! Blue Latitude has a flexible repertoire that makes them especially ideal for events where the audience consists of a wide variety of ages! 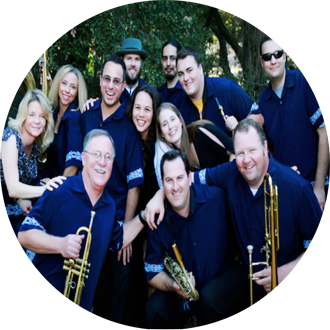 Their high-energy, classic rhythm & blues & soul sets are fun to dance to, while the five-piece horn line and the versatile background of the musicians, allows them to perform swing and jazz sets as well to satisfy a variety of musical tastes.